Or is your business about .PHOTOGRAPHY? Perhaps you’re a .FLORIST? Do you run a daycare .CENTER? The time is now to add a new Generic Top-Level Domain (gTLD) name to your business. For the longest time in internet marketing, we were limited to a dozen or so non-coutry-specific domain names: .com .net .biz .edu .gov .tv .mobi .info and a few others. 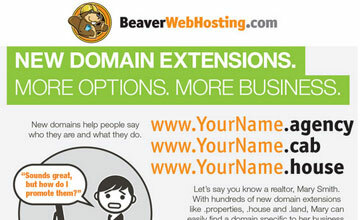 Recently the Internet Corporation For Assigned Names and Numbers (ICANN) has approved 131 new domain name extensions! There are domains now for everyone – if you sell real estate there’s .HOUSE and .RENTALs, for health professionals there are .CLINIC and .CARE, for shutterbugs there are .PHOTOGRAPHY and .CAMERA. With these new domain extensions you can create more paths to your web site, with a portfolio of keyword-rich domains, which is great for Search Engine Optimization and Search Engine Marketing.